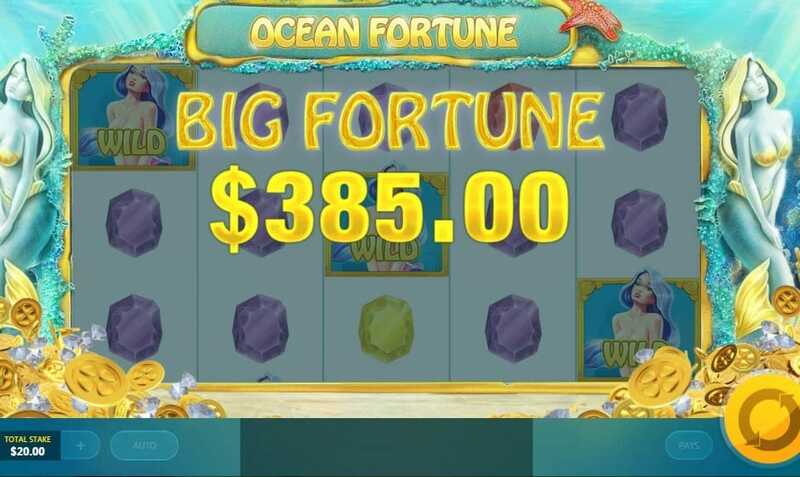 Take to the depths of the ocean in this aquatic online slot game from Red Tiger Gaming. 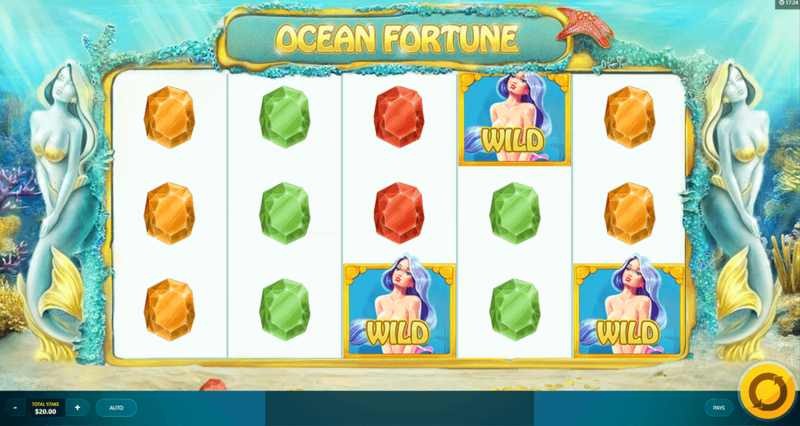 In Ocean Fortune, you search for hidden treasures under the sea while surrounded by mermaids around a coral reef. Check out our entire list of Slot games now. Red Tiger Gaming are a relative newcomer to the online casino gaming industry. Founded by a group of industry veterans as recently as 2014, the company have developed online casino games in both Europe and Asia. They won their first in 2017, having taken home the award for Innovation in Slots Provision at the EGR B2B Awards and have developed games such as Lucky Wizard, Dragon’s Luck and Five Star. This is a very fast-paced game with only few customisable settings compared to other online slot games. The game has 5 reels and 20 pay lines. The aim is to get the symbols lined up across the pay lines. You can easily select your initial stake by using the buttons towards the bottom of the screen and begin the game itself as soon as you are ready. 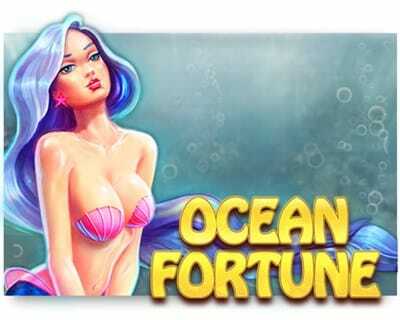 There are a number of different cash prizes available to win through Ocean Fortune. It all depends on the type of symbols you manage to get into a winning combination as well as ho much you stake in your initial bet. The game also has an auto play mode which allows you to have he reels spin automatically for a selected amount of turns without interruption. There are two types of symbol available in the game: the more valuable symbols and the less valuable symbols. Jewels are the least valuable type of symbol as they are found on the reels most commonly. They do, however, come in different colours and can be worth between 5 and 40 credits depending on the colour of the sea jewel and the type of combination you manage to land. The least common kinds of symbol on the reels, and therefore the symbols worth the most, are the starfish, necklace and crown symbols. With these symbols, you can win up to 150 coins if you can land five crowns across a pay line. Ocean Fortune also boasts a few interesting bonus symbols. The mermaid symbol is the game’s Wild and has the ability to cover entire reels at once. The mermaid can also substitute itself with any basic symbol in the game in order to help you secure more winning combinations. The shell and pearl symbol is the game’s Scatter. If you can find at least three of them then you get to activate Free Spins mode. During Free Spins mode, mermaids will appear more frequently on the reels and the low value jewels will be replaced by symbols that are worth more too. This makes Free Spin a vital part of having a successful and lucrative gaming session.